Liverpool made sure that they ended the weekend at the top of the table ahead of Manchester City after defeating bitter rivals Manchester United 3-1 at Anfield on Sunday. The Merseyside club were at their ferocious best and hounded their counterparts throughout the 90 minutes. 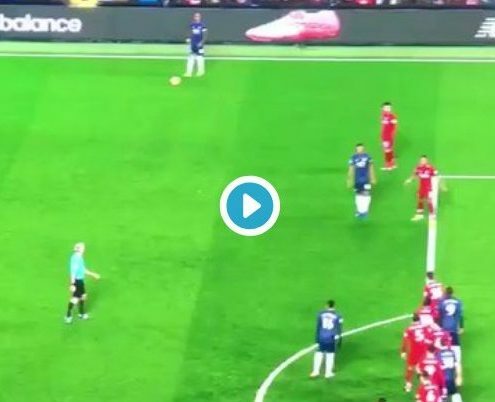 A moment which took place during a United freekick in the first half just summed up the attitude with which the Liverpool players went on in the game. Liverpool forward Sadio Mane was in the defensive line as United prepared to take the freekick and quite cheekily managed to push Romelu Lukaku out of position when the ball was hit. The Belgian was deemed to be offside by the linesman as a result. Many fans were in disbelief as to how the tiny Sadio Mane was able to shove Lukaku out of position so easily.